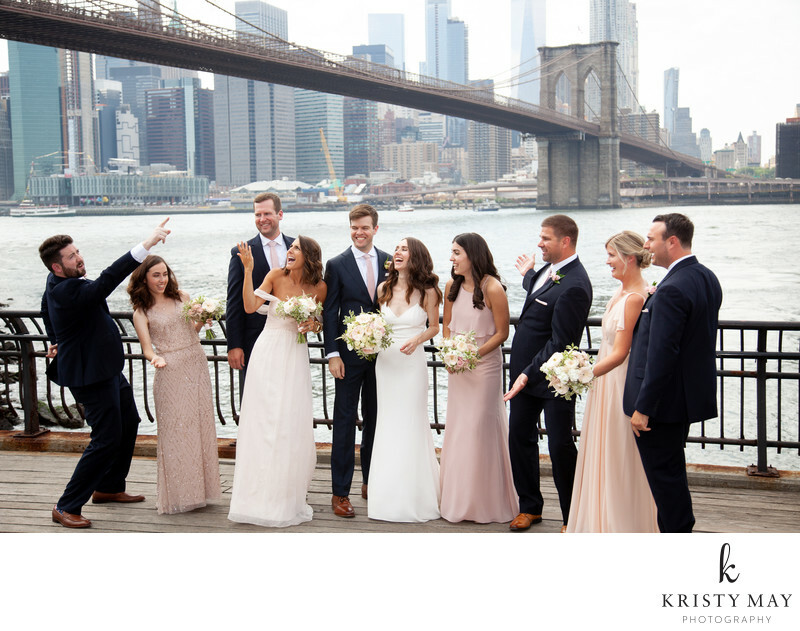 A wedding party in shades of pink take candid photos on the pier in Brooklyn Bridge Park with stunning view of the Brooklyn Bridge and Manhattan in the background. The Brooklyn waterfront is a popular destination for wedding photos anyday of the week. The views of the Brooklyn Bridge, Lower Manhattan, the Manhattan Bridge and features like Jane's Carousel make it a wonderful location. While Brooklyn Bridge Park stretches from Dumbo into Brooklyn Heights, for optimal view of Manhattan and the bridges, locations in Dumbo should be selected. There is a rocky beach and cove, Jane's Carousel, various piers, and a stairway with an overlook that is perfect for sunsets and intimate ceremonies. Location: Old Dock St, Brooklyn, NY 11201.